Unless you’re really into cars, you probably don’t know much about ball joints. Ball joints are not a fancy or exotic component of any vehicle – but they’re definitely important. Selecting the right type of ball joints for your car or truck not only improves driving performance, but also plays a key role in your safety on the road. Not sure what ball joints are the right choice for your vehicle? Our complete shopping guide has the best ball joints for 2019. Plus, we’ve included a full FAQ section will all the info you need about what ball joints are and how to find ones you can count on. Ready to hit the road? Let’s get rolling! What are the Signs of Ball Joint Failure? How Serious is Ball Joint Failure? How is Ball Joint Failure Fixed? Can You Replace Ball Joints Yourself? Strong and stable, the Moog K80026 is known as the “Problem Solver” for its ability to deliver smooth rotational movement and a secure fit. The Moog K80026 is a great choice if you’ve had previous issues with finding a proper fit. Moog’s unique design includes an oversized housing unit to keep the fit secure, which helps prevent vibrations and other problems. Additionally, socket design allows lubricants to flow freely around the ball joint. Regular lubrication helps prevent metal-on-metal grinding which can cause wear. Contaminants can also be evenly flushed away from the socket area, which stops corrosion from occurring. Ball joints are made with steel and powdered metal. Plus, Moog has an outstanding reputation in the automotive industry for high quality products and accessible customer service. 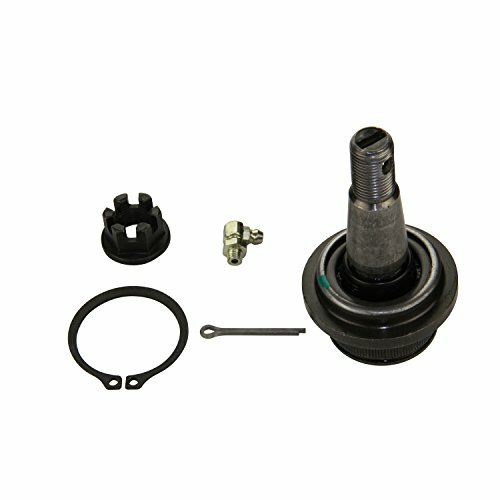 A complete suspension replacement kit for a variety of GMC and Chevy trucks which includes ball joints, arms and more. This complete chassis kit from Motorman includes everything you need for both driver and passenger side front suspension. Includes two upper ball joints, two lower, two adjusting sleeves, a pitman arm, an idler arm and more. Fits a variety of Chevy and GMC trucks from 1995 and up. These replacement parts are made using computer-controlled grinding and heat treatment operations for a precision fit which is easy to mount on your vehicle. Note that even though this kit gives you the option of replacing either the driver or passenger side components, experts recommend replacing both at the same time. This ensures the suspension remains consistent throughout the entire vehicle and helps prevent tire wear. 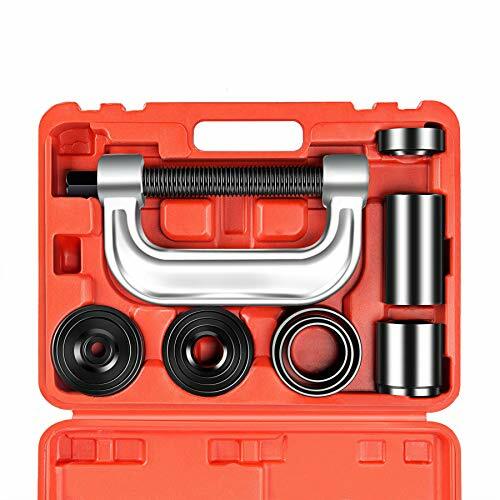 If you’re experienced enough to remove and install ball joints on your own vehicle, this complete kit from Orion Motor features a variety of tools you can count on to get the job done right. If you’re not automotive-minded, you’ll want to leave ball joint maintenance to the professionals. But savvy at-home mechanics (as well as pros) often choose this toolkit from OrionMotor. Kit includes three receiving tubs, a removal adapter, installation adapter and more. 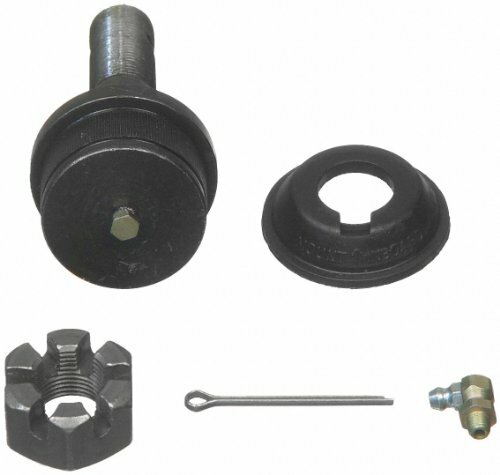 Allows you to remove press fit parts such as ball joints and U-joints. Each component in the kit is made from heavy-duty forged steel with a black-oxide finish. Resists rust and corrosion. A custom-molded case allows for quick organization and easy storage. Tools fit most 2-wheel and 4-wheel drive vehicles. Also includes a 4WD adapter to allow for work on vehicles 1967 and older which have a Dana 30 or 44 front axle. While this kit isn’t really suitable for beginners, DIY home mechanics and professional technicians will find a lot to like here. Kit contains two front lower and two front upper suspension kits for Jeep Wranglers, Cherokees and Grand Cherokees. 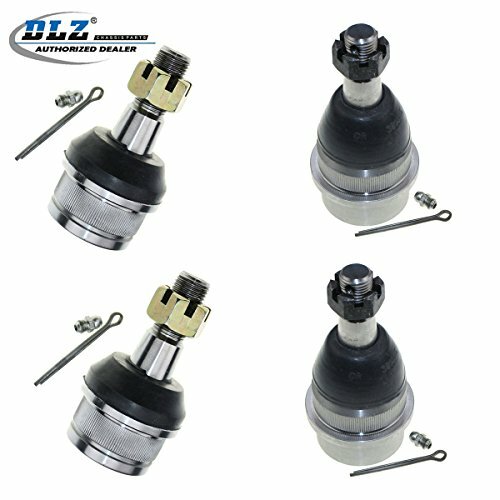 This complete kit from DLZ includes two front lower and two front upper suspension ball joints. Each joint is greaseable with a durable anti-rust surface. A double-layer dust cover protects the inside of the ball joint from wear and damage. Suitable for use in areas with lots of snow and salt. Performance is maintained from -22℉ to 248 ℉. A one-year warranty covers all parts. Moog is one of the top-selling manufacturers of ball joints for a reason. 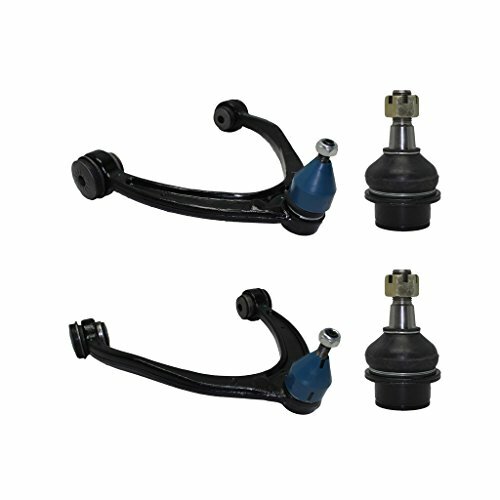 The K6541 ball joint is durable, powerful and built for a variety of cars and trucks. Another quality ball joint from Moog, the K6541 Ball Joint is made from heavy-duty steel with a powdered metal gusher to help create a smooth ride with no friction or noises. Allows for an optimal 36 degrees for rotational movement. This ball joint provides plenty of torque and stud articulation but also allows for plenty of clearance. A good choice for frequent off-roaders and other adventurous drivers. Designed specifically for Cadillac, Chevy and GMC vehicles. Although not packed with special features, these front upper control arms and ball joint assembly is a great choice for Cadillacs, GMC and Chevy trucks and cars. 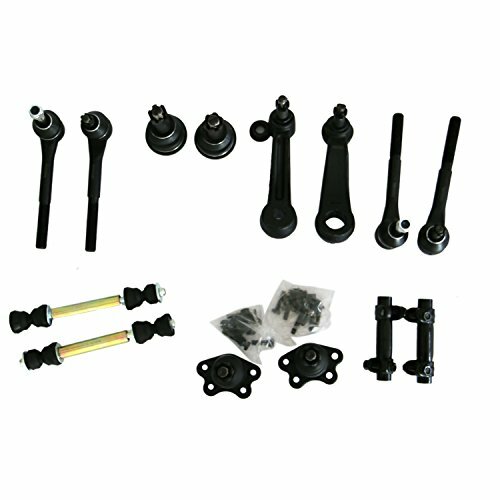 This set includes two front upper control arms with ball joint assembly. Also includes two front lower ball joints for steel control arms only. Designed for Cadillac Escalades (2017 to 2014), Chevy Avalanche (2007 to 2013), GMC Sierra (2008 to 2015) and other vehicles from those manufacturers. Ball joints aren’t much to look at, but they’re an important part of the suspension in pretty much all modern vehicles. Similar in shape and function to a human hip, a car’s ball joint connects steering and suspension. Ball joints act a pivot between the tires and the suspension. They allow for safe, accurate driving. They also connect to the steering wheel to help with steering and control. The number of ball joint assemblies in your vehicle will vary depending on the type of suspension system it has. Ball joints can be either in the front or the rear. You’ll want to know where the ball joints on your vehicle are located, as their placement will affect what symptoms are displayed if a problem develops. Generally, front ball joints are far more common. Rear ball joints are usually only found in high-performance sports cars. There are two types of front ball joints: upper and lower. Generally, the lower joints are larger and stronger, but they’re also usually faster to wear out. Weight and stress have more of an effect on lower ball joints, especially during braking. Vehicles will have either two or four ball joints on the front wheels. A vehicle with shocks and springs will have upper and lower joints. A vehicle with McPherson struts will only have two lower ball joints. Finally, ball joints can be either load bearing or non-load bearing. Load bearing joints carry the vehicle’s weight. This means they’re more susceptible to wear and typically have to be replaced more often than non-load bearing joints. Do you hear a harsh knocking, clunking or clanging noise coming from your car? That’s often the first sign a ball joint is becoming loose. Noises will be especially pronounced when the car is turning or driving across rough, uneven terrain. Does your car shake like a discount washing machine? That’s another sign of potential ball joint problems. If the ball is too loose in the socket, it’ll vibrate whenever the vehicle is running. The vibration will typically be most pronounced on either the right or left side of the vehicle. Vibrations will also often be felt through the steering wheel, too. This is a situation where the vehicle drifts to either side if your hands aren’t on the wheel. Worn ball joints can have a dramatic effect on alignment. Depending on which specific ball joint is wearing down, the vehicle will drift to either the left or the right. If both ball joints are worn down, the vehicle might drift in both directions. Ball joints have no exact lifespan. With proper care, they can last for decades. But in other cases, they can start to show signs of failure as early as 80,000 miles. Most likely, this will be due to a manufacturing or installation defect, but it’s still a possibility you’ll want to be aware of. Your ears are perhaps the most valuable tool for identifying an issue with the ball joint. The first sound you’re likely to hear is a sudden burst of noise from the front of your car. This is the sound of the ball joint dismantling. Then you’ll hear clicking, popping and snapping whenever you turn the wheel. Finally, you’ll hear a loud squeaking sound when you apply the brake and/or gas pedal. Slight shaking and noise might not seem like a big deal, but any sign of potential ball joint failure should be addressed immediately. As wear worsens, handling and vehicle performance will suffer. The looseness of the ball joint also affects wheel alignment and tire wear. If the ball joint fails completely, the suspension can collapse, resulting in a total loss of vehicle control. This can cause extensive damage throughout the vehicle and be incredibly dangerous. Don’t ignore potential ball joint problems. If you’re familiar with cars, check out the issue yourself. But usually the safest course of action is to schedule a professional inspection from a technician. Generally, you’ll want to take your car into a shop. Mobile mechanics – mechanics who arrive at your location – typically don’t have the right equipment to help with ball joint issues. Repairs typically require wheel alignment, which can only be done in a garage. You can, but only if you have relevant experience and technical know-how. But this isn’t really a repair to attempt if you’re not very familiar with car care. As discussed above, ball joints play a very important role. Installing them incorrectly can result in extensive vehicle damage. Plus, replacing ball joints can be time-consuming and complicated, especially if you’re working in a home garage. Removing wheels and control arms is typically a huge hassle unless you’re in a professional shop. However, consider buying the joints you want separately and then having a professional install them. This could potentially save you some money. For the best results, discuss this option with your mechanic so you’re sure to buy the correct products for your car. Without properly working ball joints, you’re in for a rough ride. Although they’re not much to look at, these ball joints play an important role in steering, suspension and overall vehicle control. Use the guide above to find the best ball joints for your vehicle, and you’ll enjoy a smooth, safe ride whenever you’re behind the wheel!